Current: EVERYONE LOVES SUPER DINOSAUR! Berkeley, CA â€“ 26 September 2011 â€“ Earlier this year, best selling author Robert Kirkman (THE WALKING DEAD, INVINCIBLE, THE INFINITE) and artist Jason Howard (ASTOUNDING WOLF-MAN) created an energetic all ages hit comic starring a boy genius and a genetically modified Tyrannosaurus Rex that was met with multiple sell outs and critical acclaim. 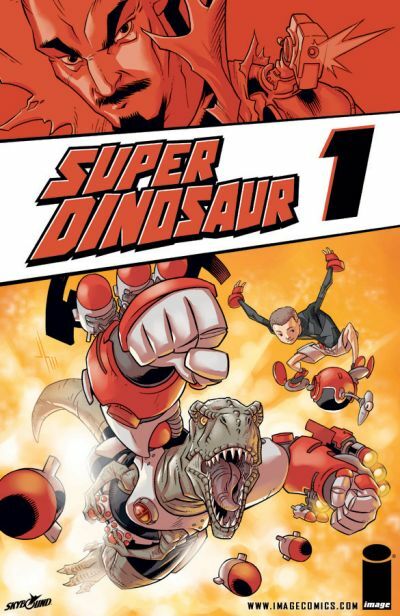 Now Image Comics is now collecting the adventures of Derek Dynamo, Super Dinosaur, and their friends into one action-packed book of awesomeness! SUPER DINOSAUR, VOL. 1 TP will be on sale in late November, in time for holiday gift shopping. It will include all the single issues through #5, as well as the SUPER DINOSAUR ORIGIN SPECIAL #1, for only $9.99. In SUPER DINOSAUR, VOL. 1 TP, the fate of the world rests on the shoulders of a ten year-old kid and his best friend, a nine-foot tall Tyrannosaurus Rex who loves to play video games. The Evil Max Maximus wants to get to Inner-Earth! He wants the dinosaurs that live there! He wants the powerful DynOre mineral that originates there! Super Dinosaur and Derek Dynamo are the only ones who can stop him! SUPER DINOSAUR, VOL. 1 TP (SEP110433, ISBN: 978-1-60706-420-6), a 128-page full-color all ages action adventure trade paperback for $9.99, will be on sale in stores November 23. For more information about the awesomeness that is Super Dinosaur, visit http://superdinosaur.com/.